Three Creeks Farm does a number of off-site events. We try to keep this list up to date. You can also follow our Facebook page for more information. This is the open house of our good friends Paul and Patricia Ferrell. There will be food, pottery, woodwork, and much more. We will not be able to attend this year due to a scheduling conflict. Check out their Facebook page. 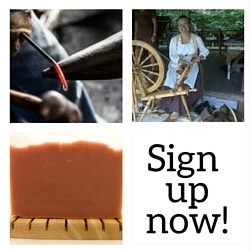 Three Creeks host the Middle Tennessee Fiber Festival. It is held annually on the Friday and Saturday of Memorial Weekend. For more information, visit the festival web page listed above, Facebook page or a short description here. Bring your ready to dye yarn or wool, dye pots if you have them and a sense of adventure. I will have Earthues natural dyes for sale as well as mordants, wool and un-dyed yarn. We do not charge anything, but do ask for donations to cover the cost of propane. We will have a meal about noon, so bring a dish or desert to add. Wear weather appropriate old clothes that you don’t mind getting dye on.